I’ve been so excited to see what opened in the formerly abandoned bank building at 45th and Walnut Streets. It’s always been a stunning building, and now even more so. Manakeesh, a family-run Labanese Bakery opened just over a month ago in the old bank building after a stunning and warm renovation to the inside. Manakeesh is not “fancy” but it provides delicious food at very welcoming prices, a killer espresso machine, and a broad selection of home baked pastries. I came in for “brunch” with a friend and we both ordered coffees and manakeesh – house-made, grilled flatbread sandwiches filled with fresh toppings. 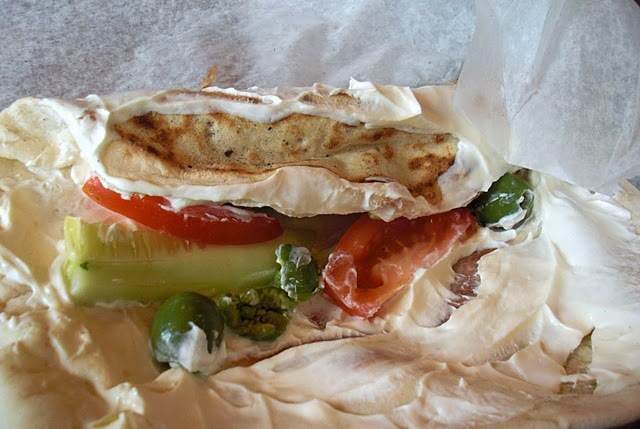 I enjoyed the labneh above – a yogurt cheese spread with cucumber, tomato and wonderful, meaty green olives. 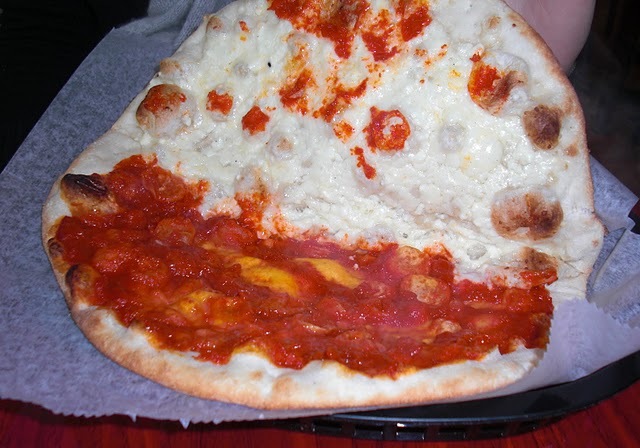 My friend ordered the “hot cheese” pictured below; Cheese and fresh spicy pepper paste baked on a flatbread. Both were delicious, the service was friendly, and I’m sure to be back. Manakeesh also offers catering, for that extra-special office or house party.